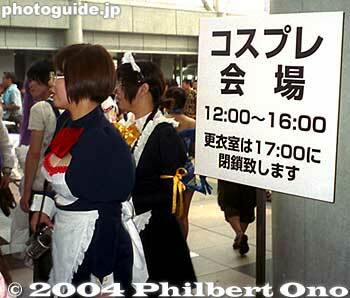 会場 - The sign says "Cosplay Kaijō" meaning Costume Player area (where you can pose for photographers). They are allowed to use it from 12 noon to 4:00 pm. And they even provide a dressing room (closes at 5 pm) for these costumers who attract visitors to the comic book show held there. Taken at Tokyo Big Sight.